Mexico: "Where is my son?" The abduction and probably murder of 43 Mexican students in Iguala, a little town in the Guerrero state (south) has horrified the entire world. Foreigners may wonder, how a mayor can command the abduction of more than 40 persons and think, that he would get away with it. But in Mexico this doesn’t sound that crazy. In fact, thousands of people disappeared in the last eight years in Mexico. How many isn’t exactly clear or proven. But estimates reach from a minimum of 20,000 to 30,000 people. But who is behind this abduction and why does this happen? The culprits behind are often organized crime groups (dedicated mainly to drug traffic, but also robbery, extortion, kidnapping…). But also the Mexican State security forces are involved and quite often they work all together, as it happened in Iguala. That is possible because many of these crimes are unpunished. Iguala is not a single case and definitely not a new crime in Mexico. This is a fact very well known in another village: Atoyac de Álvarez, only 108 kilometres away from Iguala. In Atoyac de Álvarez, a group of families has been trying to find out what has happened to their relatives for almost 40 years. During the 1970’s, in a period known as the “Dirty War”, the Institutional Revolutionary Party (PRI) had the absolute power and used violent repressions to fight the contestation of legitimation by the Mexican population. In four decades of this government 800 people were officially reported as missing. According to the Human Rights Violations Victims Relatives Association in Mexico (Afadem), more than half of them lived in Atoyac. In Atoyac the peasant’s guerrilla Poor’s Party was based, lead by Lucio Cabañas. He was a teacher who had studied at the rural teachers school in Ayotzinapa, where the killed 43 from Iguala also studied. 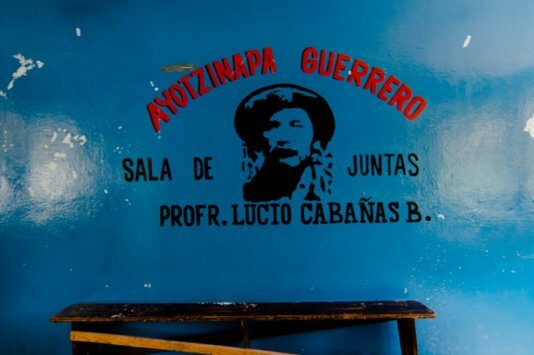 The walls of this school display nowadays paintings of Cabañas and other popular revolutionaries as Emiliano Zapata, Ché Guevara or Mao Tse Dung. A sign for the social struggle of its students, who are young poor peasants from all over Guerrero, one of the poorest Mexican state and most oppressed by “caciques’ rules”. Rosendo Radilla is one of the victims of Atoyac. A peasant leader, who had composed some songs dedicated to the guerrilla. He was arrested at an army checkpoint on the 25th of August 1974 meanwhile sitting in a bus next to his 11-years-old son. “What am I accused of?”, he asked the soldiers. “You write corridos”, one of them answered. “And is that a crime?” “No, but you fucked up”. He was taken in a helicopter and his family never saw him again. “My brother come back home and told us that my father had been arrested. We began to look for him, but the Army always denied they had taken him”, explains Tita Radilla, the most active rof Radilla’s family in the search for Rosendo. 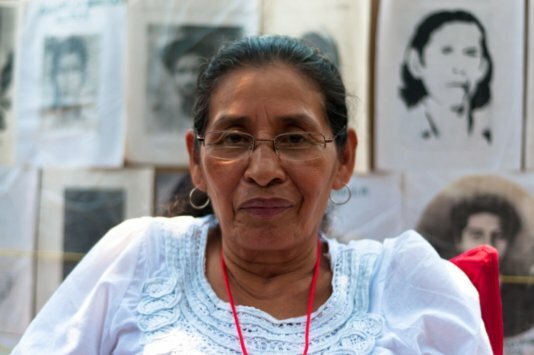 “Now, I know (by other detainees, who got free) that my father was brought here and he was kept for a while in this place”, she says in the City of Public Services, a compound of city council offices working in the same barracks, which served as an Atoyac’s military base in the 70’s. “We don’t know, if he was taken out of here. He was at the mercy of those people (the Army)”. The Radilla’s and hundreds of other families in Atoyac and in the rest of Mexico have been trying for years to find out, what happened to theirs loved ones. But they have to face indifference as answers from the authorities. 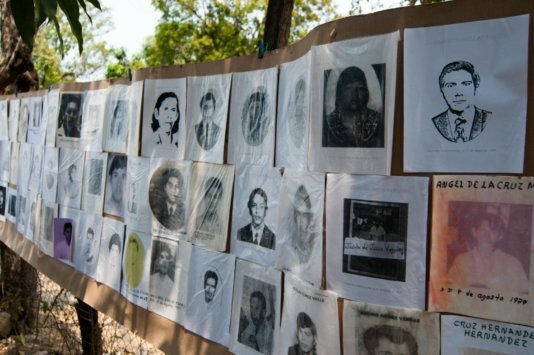 In 2006, the Mexican Government reluctantly admitted the forced disappearances and other human rights violation in the 60’s and 70’s. But the government accepted neither any responsibility nor the duty to find out what happened to the missing ones. Afadem took Rosendo Radilla’s case as an example for all missing people in Atoyac to the Inter-American Court on Human Rights. 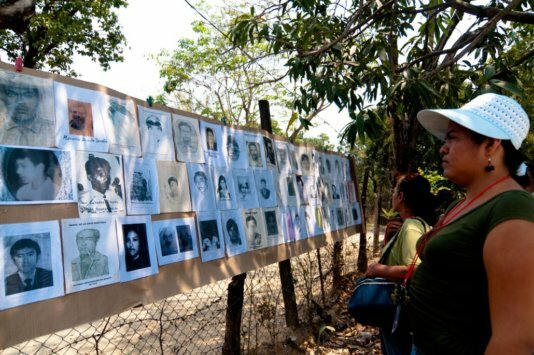 In 2009 this autonomous institution of the Organization of American States finally condemned the Mexican State and demanded clarification the fate of the disappeared ones during the “Dirty War”. Thus, the Mexican Government was in a tight spot and launched an inquiry to find Radilla. But the victims’ families considered it a farce. Based on testimonies of other detainees four diggings have been carried out in Atoyac’s former military compounds - they have been all unsuccessful. The families demand the interrogation of Army official who lead the repression in Atoyac those years and the opening of military archives. “Actually, the Government knows the truth. 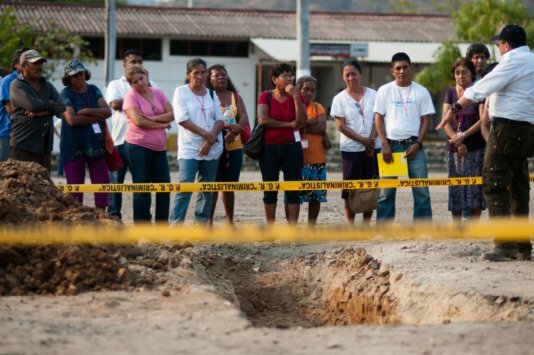 They know where they were left, if they were thrown to the sea, if they were buried…”, claims Maria Argüello, who wants to know the location of the remains of her husband, Prisciliano Medina and of her father, Francisco Argüello. “They buried people in the mountain”, relates María. “And people didn’t report it because they were afraid of the government. They still are, because many of them haven’t yet reported their missing relatives. They fear the same thing may happen again”. According to Afadem, there’s a cause-effect connection between the disappearances of their relatives 40 years ago and the current ones. “All this is a consequence of the impunity prevailing for so many years”, Tita Radilla warns. “They (security forces) were allowed to do anything they wanted with our missing relatives and that has gone on up to now. Those perpetrators were teachers for the present ones”, she adds in a reminder that many organized crime members are former cops or soldiers and many security forces agents work together with them - as it also happened in Iguala.